In 2019, we’ll keep the Real Food flowing with a new class each month, with fun themes and great new menus to keep you happy in the kitchen all year long. A class that teaches what you should you keep in your kitchen to be a Hipcook, always ready to make something amazing out of (seemly) nothing. 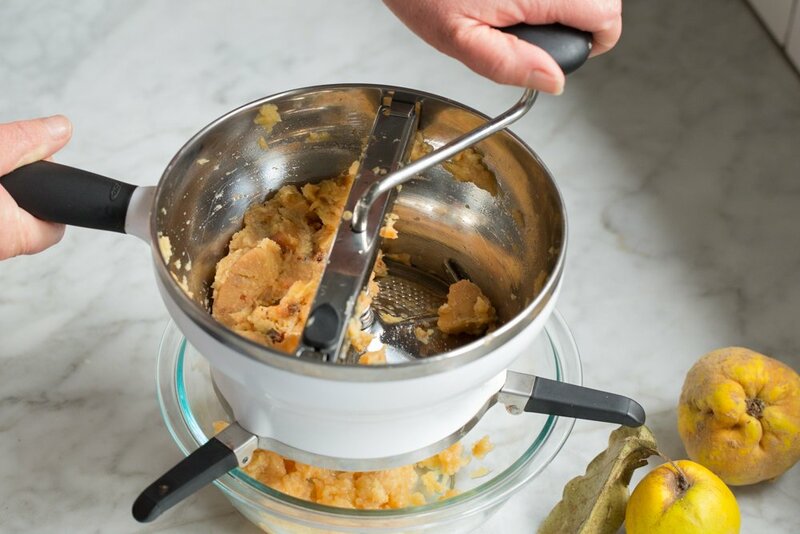 Come & learn to make cheese, cheese, glorious cheese at this Hipcooks Workshop! Here are protein-rich, satisfying meals that are gluten & dairy-free. An adventurous menu featuring modern Italian cooking. It’s summertime outdoor concert season — be a hero at the picnic! It’s too hot to eat hot food! Delight your beloveds with this gorgeous summer menu. It’s too hot to eat hot food! Delight your beloveds with this gorgeous summer menu. Vietnamese or Lebanese? We can’t decide which (or both?) Help us decide please. COMMENT BELOW! As if we need an excuse for sausages & beer! Here’s a delicious German menu paired with fine wine. What would you like to see at Hipcooks? We’ve left this open for you to chime in and please comment below, we’d love to hear from you! Make a Promise to yourself that you can honor the whole year. Enjoy wonderful energy & great health when you eat nothing processed. Real Food Only! Make it a Year of Abundance, not of sacrifice. When you eliminate all processed foods, reward yourself by enjoying all real foods – yep, that includes butter, cream, cacao, salt, sugar & wine. Be a guiltless omnivore! If you can’t pronounce it, don’t eat it! In fact, make it simpler on yourself by not purchasing anything that needs a label. Instead, enjoy ingredients of the best quality, because you, my dear, are worth it! Shop the perimeter (only) of the grocery store, enjoy Farmer’s Markets, and let Hipcooks give you confidence & inspiration to keep cooking! If you’re a person on the go, we’ll help you with simple, delicious recipes with just a few ingredients. We’ll spice things up for your culinary adventurers who love to spend time in the kitchen. 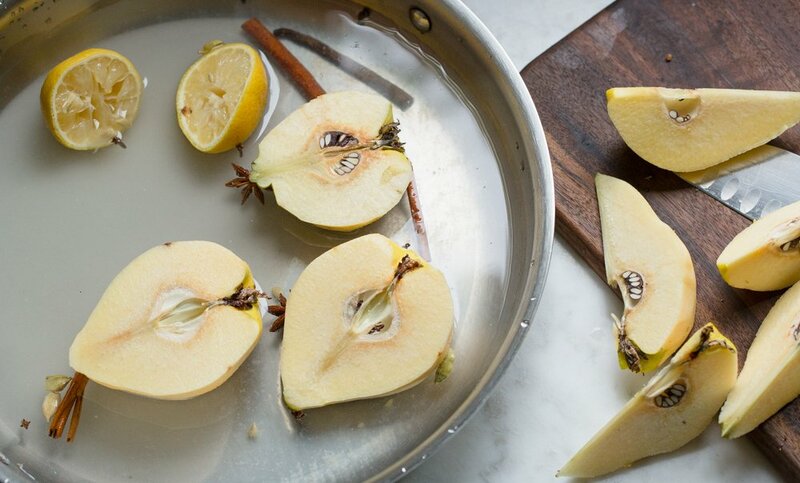 Hipcooks hand-cured cutting boards will give you a lifetime of cutting and serving beauty! Made of solid-round tamarind wood, they have a handle for easy storage and drip-dry. I loved the Lamb & Quince recipe from Day 5, and I could not let the concept go! Lamb and quince dance in such harmonious complementarity and I simply had to post another recipe. 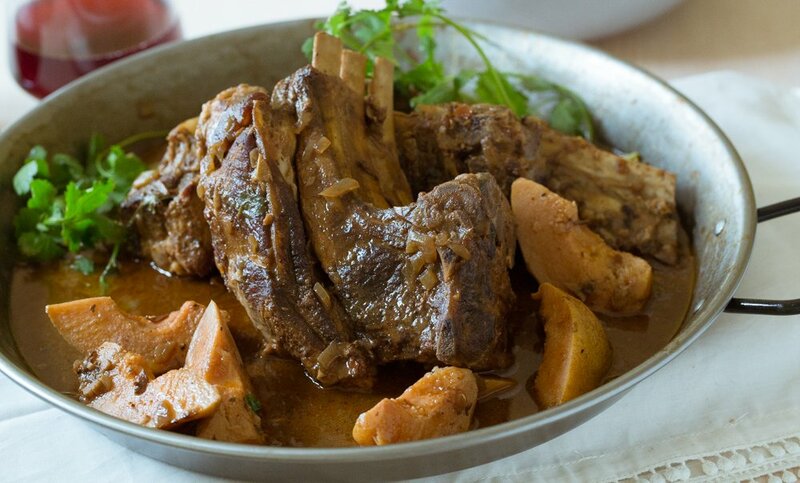 In case you were not grabbed by the first posting, here I pair the lamb and quince in a stew scented with saffron and honey. Think about it, maybe for the last night of Hannukah. Remove any innards that may be inside the chicken, rinse and pat dry. 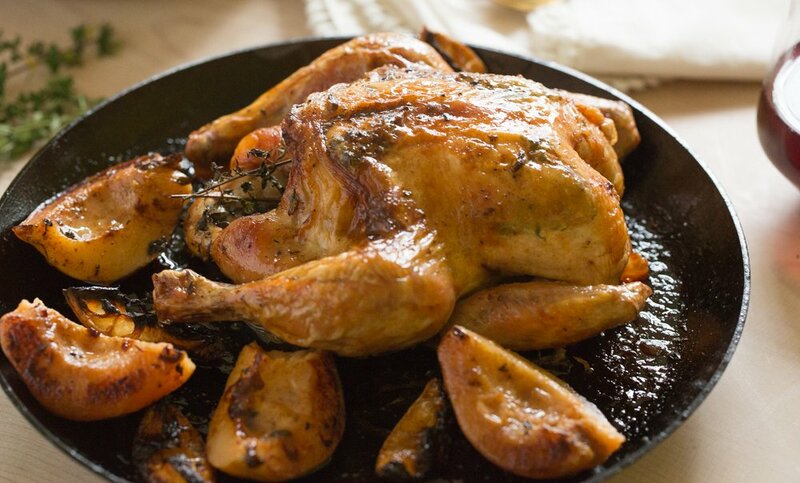 Place the chicken on your work surface, legs facing up, with the cavity open to you. Using your fingers, gently separate the skin from the flesh of the bird. Place a couple of thyme sprigs on each side. Fill the cavity with the rest of the thyme. Squeeze the lemons on the outside and inside of the bird, placing a few inside the cavity and others scattered around your baking dish. Season liberally with salt and pepper and brush with olive oil. Pop into the oven and bake about 20 minutes. 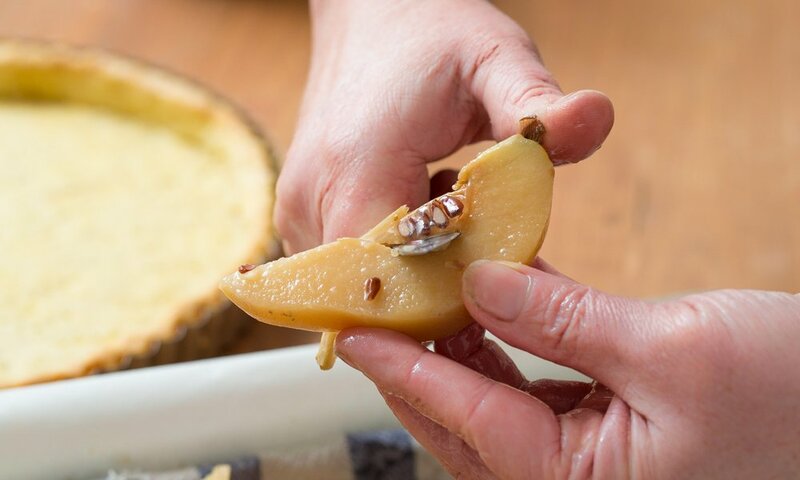 Remove the baking tray from the oven, add the poached quince slices, and move things around a bit (coating the lemon and quince in the bird juices, giving them the chance to brown and caramelize). Pop back in the oven and bake until the bird is cooked through, and things are looking delightfully browned and crispy. 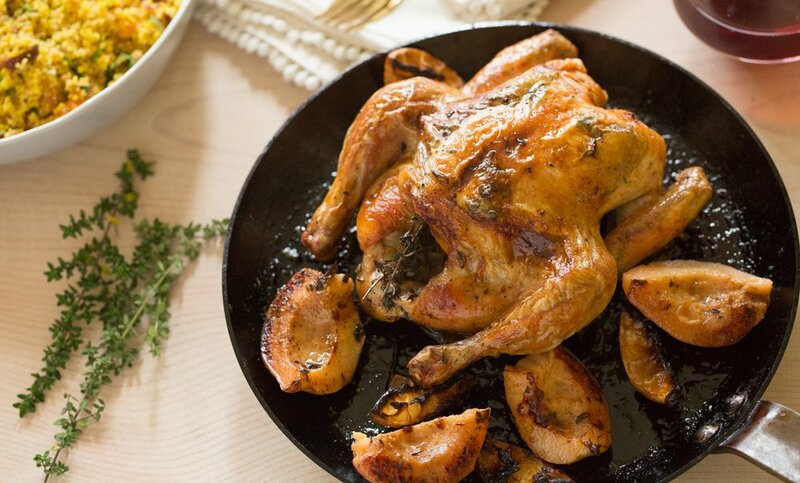 Allow the birds to rest a few moments before serving. 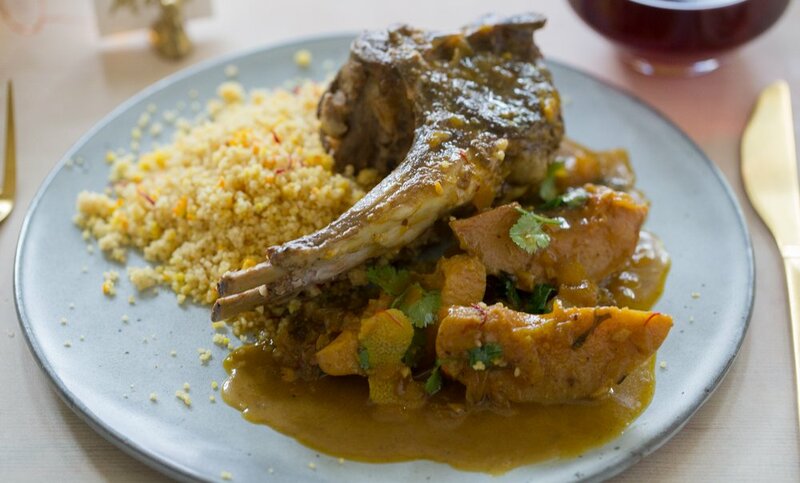 I like to pair this with saffron couscous and a bright, herb salad. 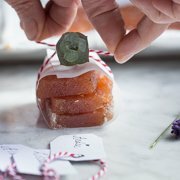 Another great use of your Poached Quince: Quince Paste, or dulce de membrillo as it is called in Spain and South America. You’ll see it on a Tapas table, served with Manchego cheese. If you’ve never tried it, you must…the pairing is excellent! 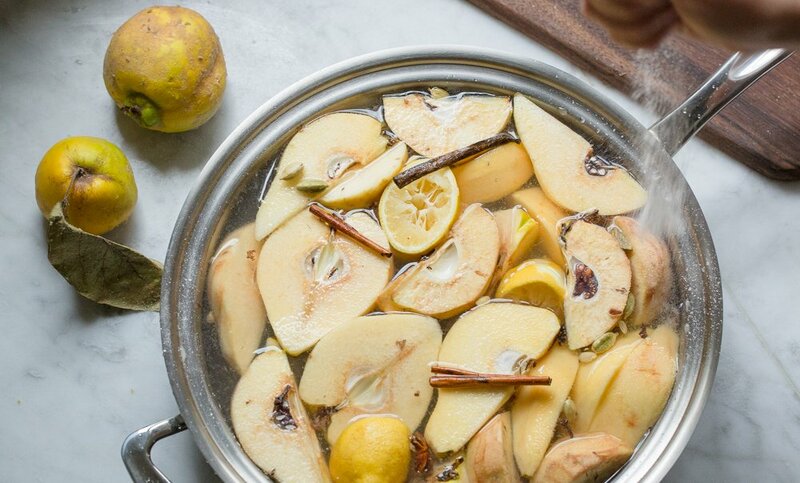 Begin by running the poached quince through a food mill. 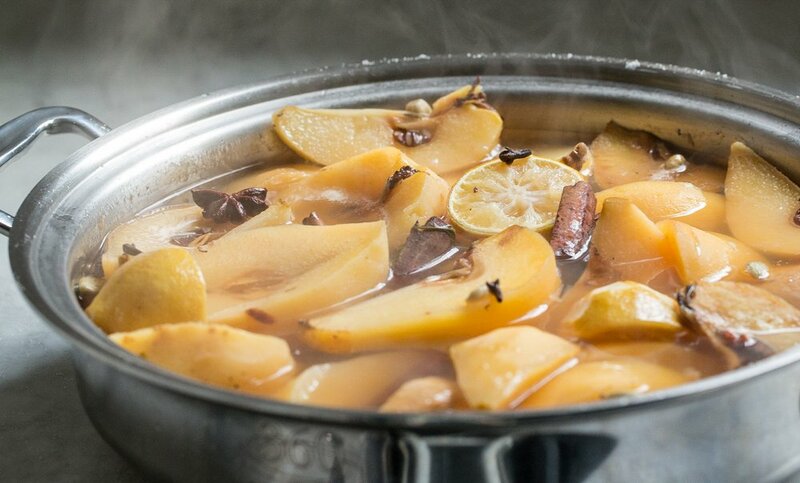 Weigh out equal parts of quince paste to sugar, and pop in a pan on high heat, stirring all the way. 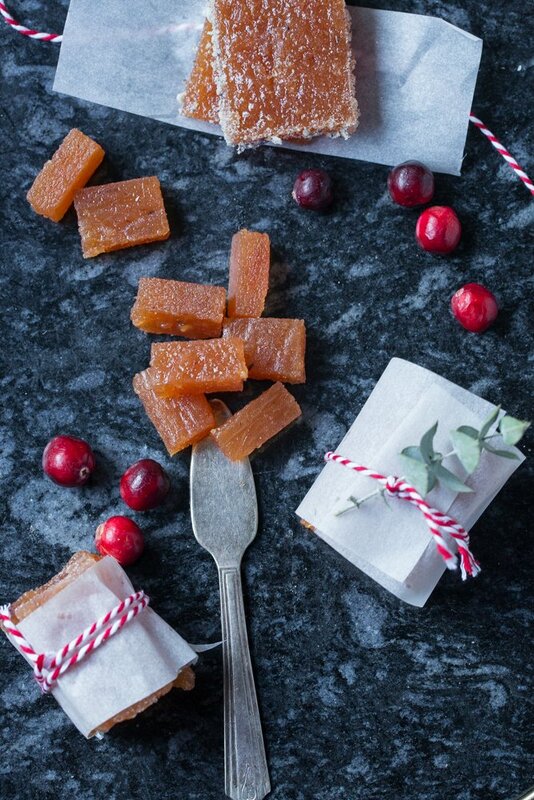 It will bubble away happily, as the sugar dissolves and caramelizes. It’s ready when it is nice and thick, and a deep shade of orange. 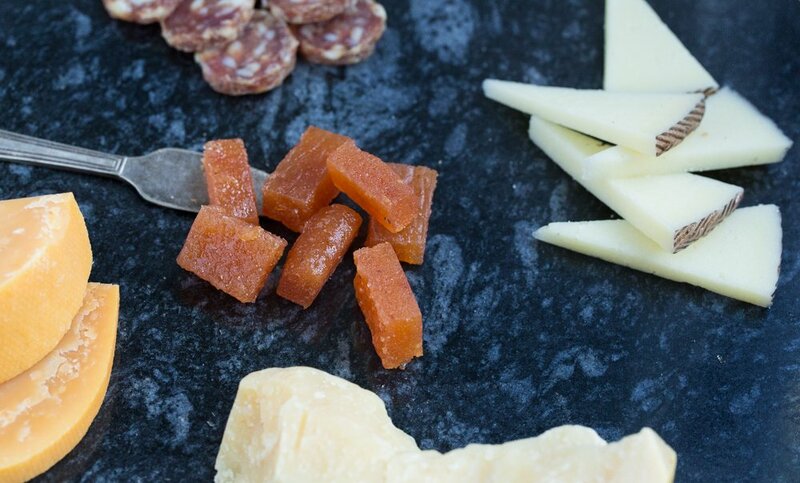 …perfect for a cheese plate! Are you inspired? or looking for more inspiration? Then come check out Viva España: ¡Tapas! at Hipcooks. It’s a blast! We’ll transport you to Sevilla as we prepare all kinds of gorgeous Spanish nibbles, full of color, texture, & flavor. We’ll show you how you can throw the perfect Tapas party at home for all your friends. 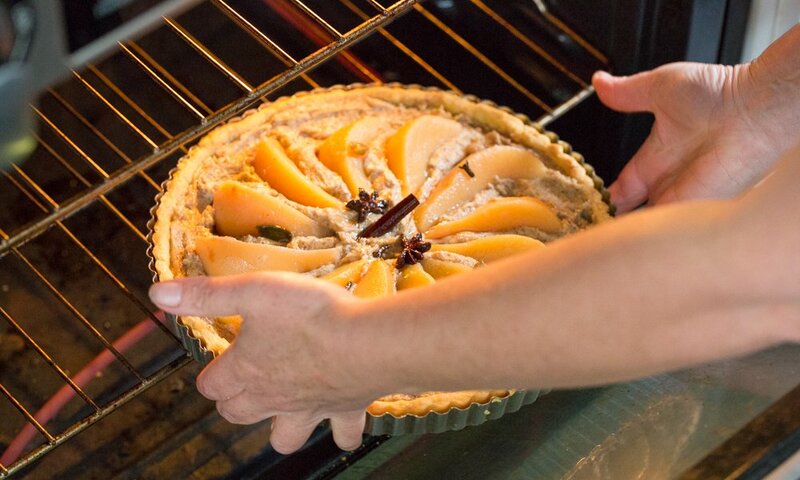 We’ll share all the make-ahead tricks so that you can have time to be the perfect host. This is our most popular class since Tapas offers a little something for everyone. 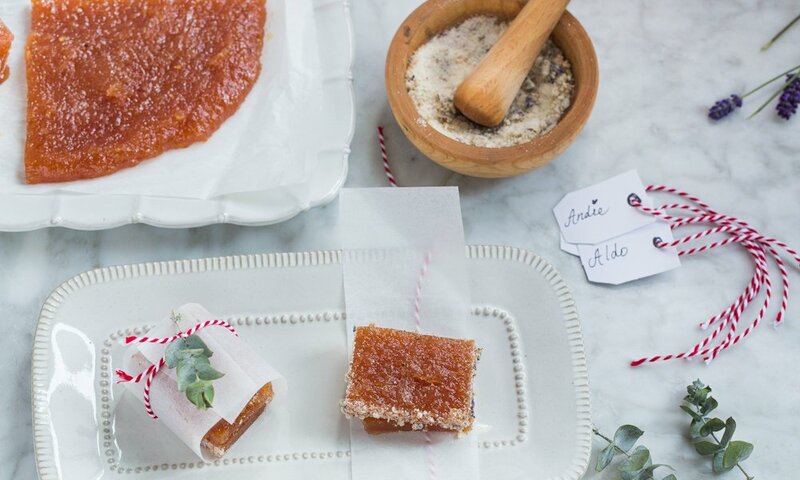 Aside from being a delicious item on a cheese plate, quince paste makes for a darling little holiday gift, made with love. 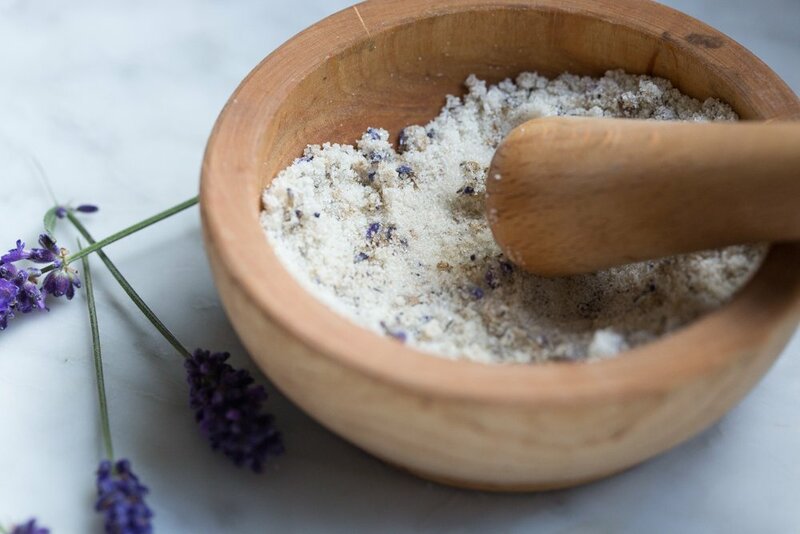 It’s not necessary, but delicious and cute to boot to grind up a little lavender sugar for the cut edges of the quince paste. 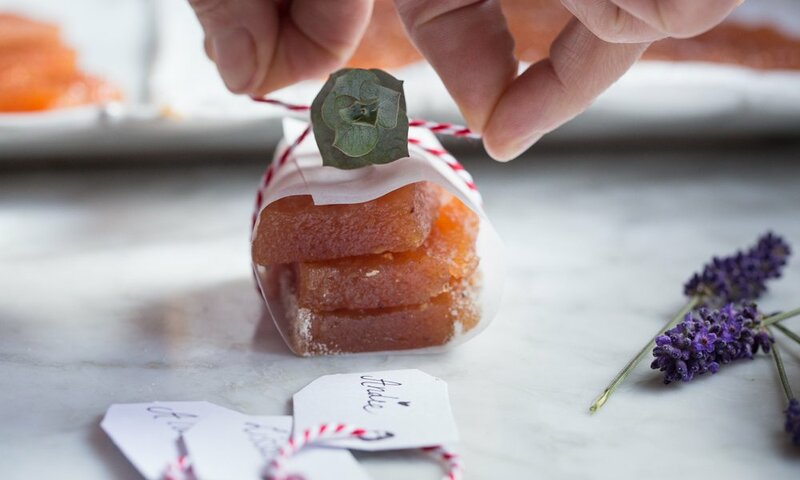 Anything edible can add to cute packaging…a lavender sprig or a eucalyptus leaf tied in a holiday bow makes it look special. Quince paste will keep for a long while in the fridge, but who can resist enjoying it right away! Rwaaar! 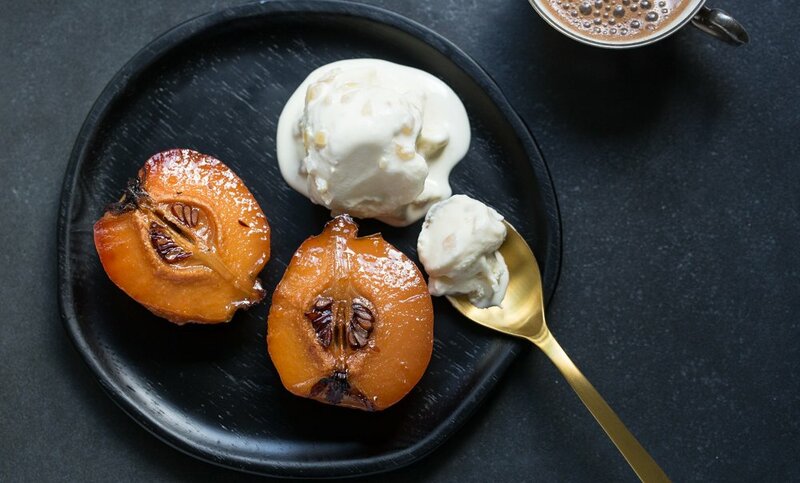 Here’s an elegant dessert that takes no time to prepare. Honestly! 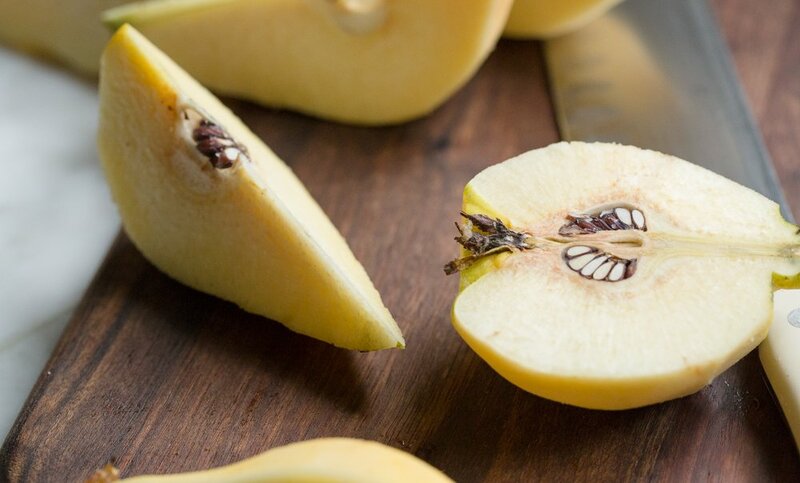 You’ve already poached the quince, so all you need to do is roast in a 350°F oven until they are warmed through and the syrup has dried to a shiny glaze. Ice Cream… go ahead and make your own, it’s fun! Or, simply sprinkle store-bought vanilla with chopped crystallized ginger and a nice boozy plop of amaretto on the top. Everyone will love it (and you!) just as much. 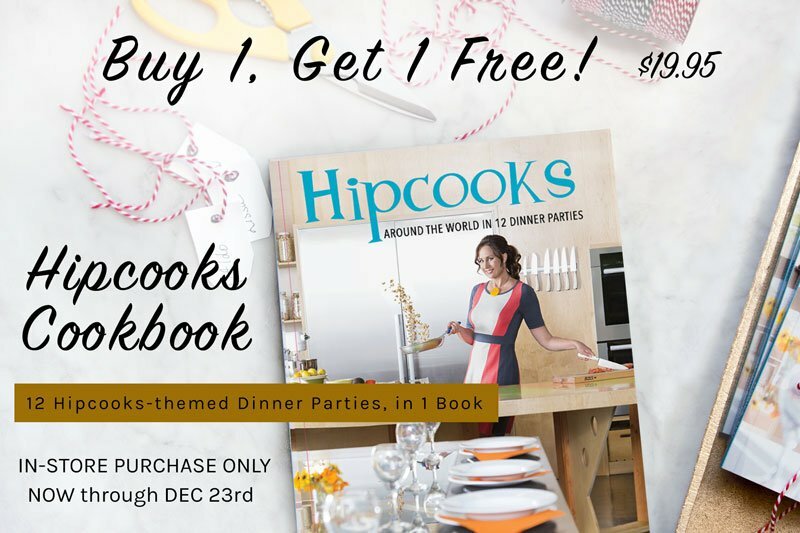 Hark, the Hipcooks angels sing: Happy 12th day of Hipcooks, everyone! Here’s a holiday table topper to crown the meal. 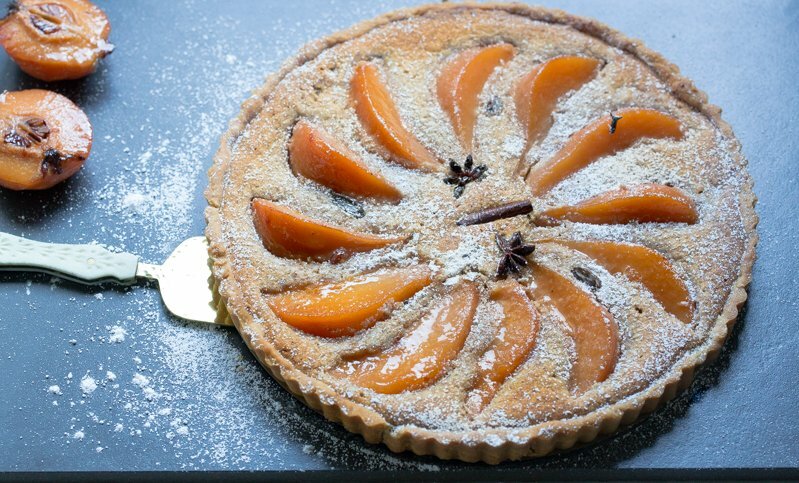 A quince and frangipani tart, served in solitary splendor, is a showstopper of a dessert. 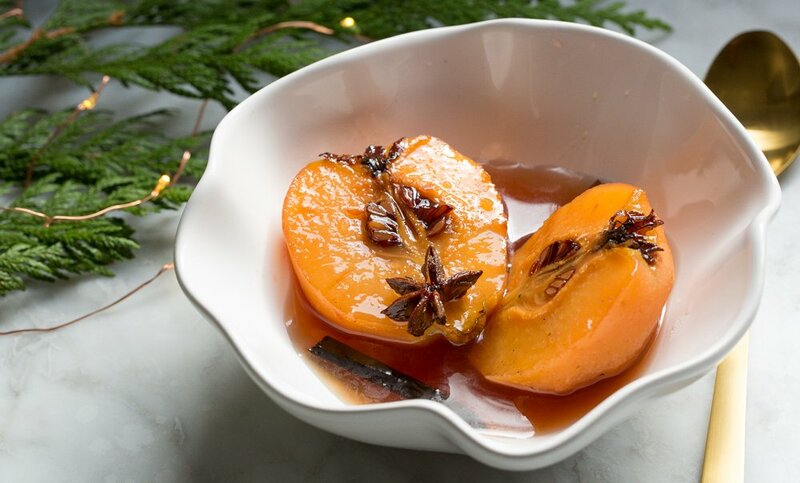 I hope you have some poached quince left…are those beauties still sitting on the mantle, or have you been a busy Hipcook? There are a lot of steps to preparing this dessert — the good news is that you can space it out if you need to. Make the sweet pastry case one day, the frangipani on another, and the rest is child’s play. Next, prepare the frangipani. 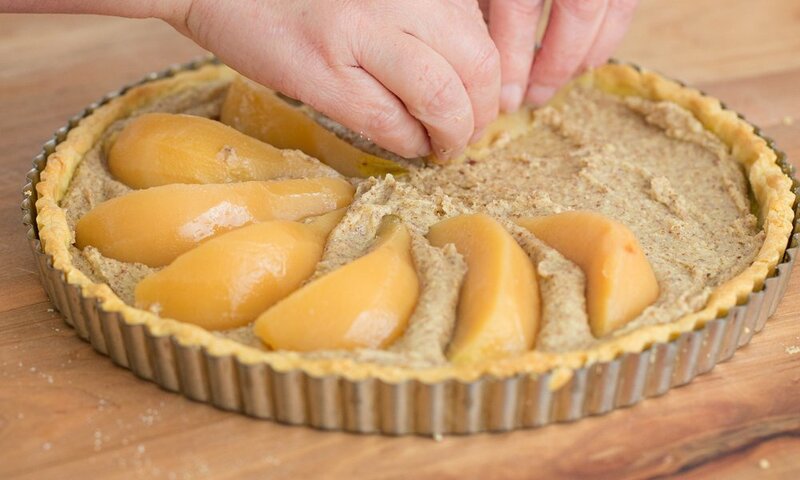 You can store it and assemble the tart on another day, or go straight to the assembly. 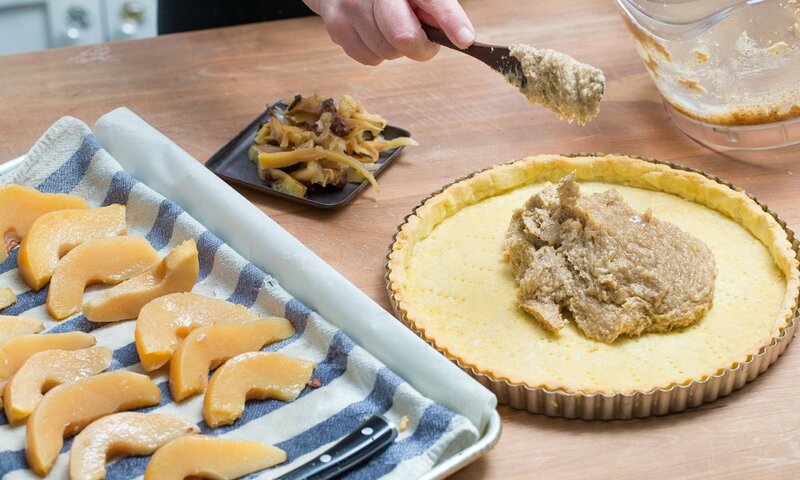 Plop the frangipani in the pastry case and artfully arrange the quince on top. I grabbed some of the cloves, cinnamon and star anise from the poaching liquid to adorn the tart. Into the oven it goes! 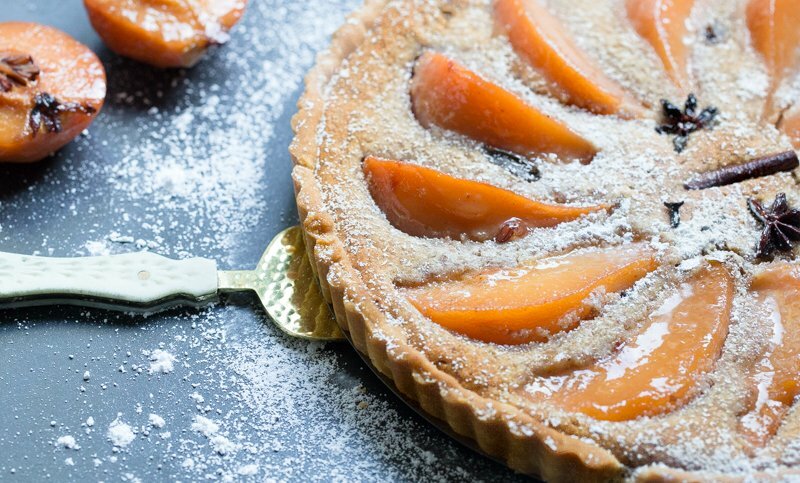 A dusting of powdered sugar is all you need for a gorgeous presentation. We hope you enjoyed this season’s 12 Days of Hipcooks! We wish you joyous & happy holidays.